← Cleaning my Casita! Wiring the solar panel! Power runs through it . . .
Pay attention. This is going to get highly technical. Ready? Okay. Here goes. The solar panel came wired with two fat, round, black wires with connections on the ends (See Nov. 30 slideshow.). Kathy climbs up on the roof of the Perfect Tow Vehicle and scrapes out the RTV. That’s RTV, not PTV. Admit it. You don’t know what RTV is, do you . . .
It’s Room Temperature Vulcanizing, an elastomer sealant, used for potting and encapsulating electronic components. In other words it’s blue, glommy goo that you squeeze out of a tube over things you want to stay put (no, not your dog . . . don’t be silly!). When dry it’s like a rubbery plastic and it seals things from the elements. Okay? Got it? Can we move on now? After Kathy gets all the RTV scraped out, she climbs back down. I hold the ladder. Then Bill gets up on the roof. I hold the ladder. He pulls out the wires from the box on the back of the panel and replaces them with a long, flat, white wire. He then covers the connectors and wires with RTV, which you know all about because you read the second paragraph very carefully. He replaces the little black plastic cover on the box. The white wire runs to the crossbar of the roof rack. Well, it doesn’t actually run. It goes to the crossbar. Not goes as in moving from one place to another, it starts at the . . . Oh, never mind. Bill asks for some duct tape. All I have is neon green duct tape. He globs some RTV onto the wire and puts the neon green duct tape over it all to hold the wire to the back of the solar panel. Now stop skimming! Focus! Bill reads my mind which is not especially difficult to do, given my screwed-up face. “Don’t worry. I’m going to paint it white.” He spray paints and looks down at me for approval. I approve. The wire must be secure to prevent flapping when the PTV is on the highway. Next Bill brings the white wire along the crossbar, securing it with plastic ties. The wire enters the PTV through the door. The door closes easily on the wire, as the spongy trim compresses. See the little white wire running into the PTV? See the neon green duct tape painted white? See the tree in the window? Now you know why it is important to have flat wire! Wire from roof rack through closed door. Duh. The wire runs . . . well, whatever . . . to the solar charge controller mounted on the battery box. (See Nov. 30 slideshow.) Bill climbs down off the roof. I hold the ladder. Kathy, who has many wonderful qualities not the least of which is being slim and tiny, crawls in between the bench seat and the battery box/inverter/controller area, and connects the temperature sensor wire from the interior of the battery box. Bill picks up the remote meter and pushes buttons. For the finishing touch, Bill climbs up with a spray can of Valspar anti-rust white paint and sprays the four edges of the rack supports that were sawed off previously. P.S. from Spike . . . 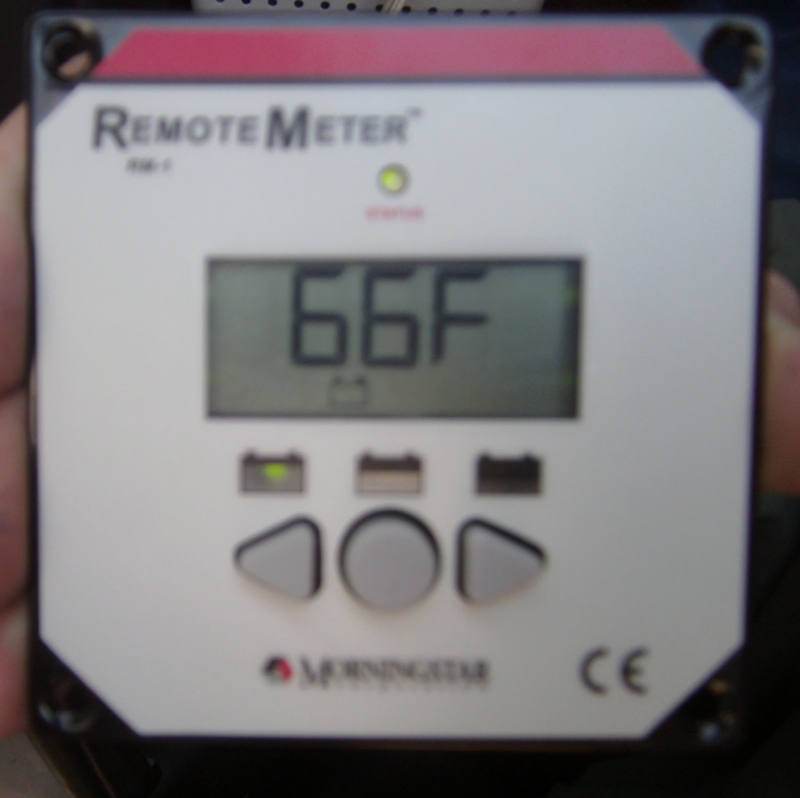 This entry was posted in Simple living and tagged charge controller, fulltiming, inverter, remote meter, RTV, solar energy, solar power, temperature, Tow vehicle. Bookmark the permalink. 21 Responses to Power runs through it . . .
is very informative too, also!!! I know you are very proud of the new solar system and it really looks nice!!! Hope your day is going great!!! Um, running from a coyote is NOT FUNNY. Anyway . . . It’s good to have the panel up on the roof. Glad you like the way it looks! Now I’m laying low til the weather settles down. I hope you are having a great day, too! I love it! Still giggling here! I agree with Butterbean….. funny lady writes funny blog! Ha! It just shows that you are happy! You were happy to be in Elephant Butte despite the coyote problem and your blog showed it! You are happy to finally have solar and this blog shows it! I am happy you are happy, especially since the weather is so…. well to be polite I will say “yuckky”! We have a few snowflakes up here in T or C! Hope your weather is better 23 miles south of here! Congratulations on finally having the last step of the solar completed! We are excited and happy for you! Now if the weather would just get nice again so you can take off and explore!!! No snow yet, as of 1:30 p.m. I can’t tell you the temp because the crew and I haven’t opened the door since the bathroom break at daybreak. And as long as the canine bladders hold, we’re NOT going out! Your dogs have bigger bladders than ours…..I’m walking them again!!! All the solar looks great! The crew has been “undercover” all day! Spike is plastered up against me, snoring. I love this little guy . . .
One thing to watch for is water running in following the wire from the solar panel. I had that happen once with a coax wire from an antenna. Hmm… something to look out for. It is pretty snug when the door shuts on the wire. Bill and Kathy do nice work always. Thanks, Jool! I had to show off my new knowledge . . .
Definitely the most fun to read “technical” post I’ve ever read. Pretty sure I have NEVER laughed reading technical material before. AND I understood it AND I’m going to keep all these solar panel posts together so I can get this put on my rig. Now where do I hook up with those folks who decided what you needed, ordered it all and installed all and understand it all for you???? If anyone else had written this, I’d have never made it through. Now I know all about the white wire and how it “runs!” Now if we could just get a good day of sun! Congrats! Today is definitely not a good day of sun! I’m glad you made it all the way through the post about a wire! Did you look in the header of my blog? Yesterday I added a place called Solar Power where I’m going to put pages of information about components and photos, so people don’t have to wade through daily posts. It has a pull-down menu. Only one page added to the menu as I write this . . . the Solar Panel. You’ll find specs and a link to the solar company. Sue, as usual this was another very entertaining entry! I am familiar with RTV, by the way. When I was a millwright working in an aluminum plant we used RTV to stick all kinds of things together! It is a very good adhesive as well as a waterproofing agent. Anyway, thanks, I love our writing, you always make me laugh. It’s a challenge to make the blog interesting to people with varied interests. Some people want to read details on solar installation, and others probably couldn’t care less! Thank you! I did my very best! Yes, I never worry about the quality of work by Bill and Kathy. 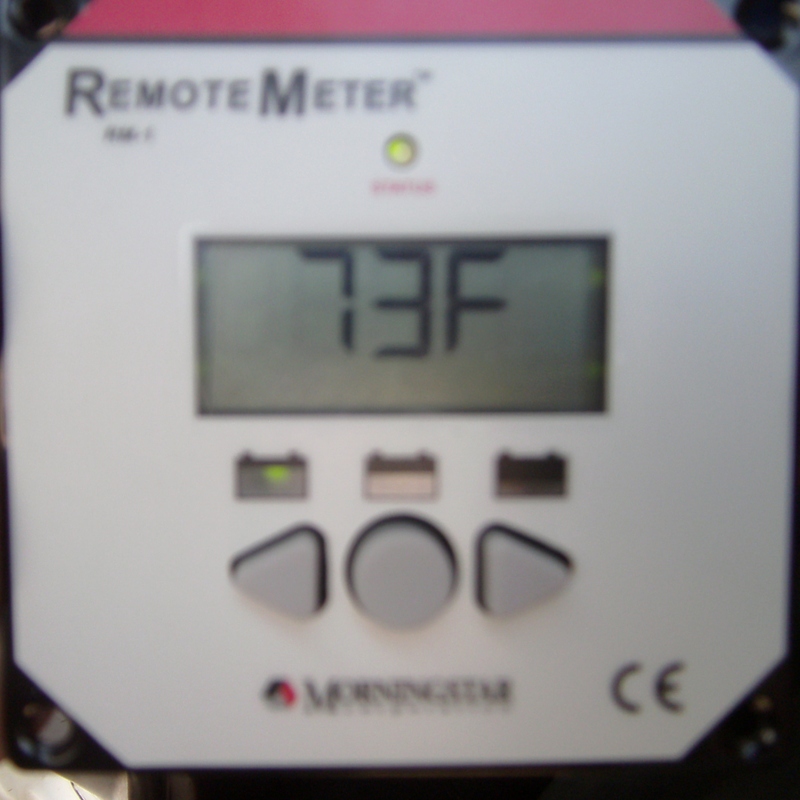 What gauge is the wire from the solar panel to the controller ? And, what gauge is the wire from the controller to the Battery’s ? Thank you. I plan to explain the wiring more fully in the pages I’m posting from the header. But to answer your question . . . The wire from the solar panel to the controller is 16 gauge. From the controller to the batteries is 14 gauge. (There is a 20 amp fuselink on the positive side, so in case there’s a short, we don’t have a fire.) The two batteries have #4 gauge to the inverter (DC input). The 120V AC out to the rv plug runs about 9 feet and I think it’s #14. We tested the current on these wires in these applications and the loss was miniscule or nothing because the distances are so short. I hope this is helpful.